We lead off our 2015 team previews with our poor, beleaguered Redlegs. The Reds had a weird off-season. They mulled the possibilities of trading the likes of Jay Bruce, Johnny Cueto, and really any other veteran that teams would listen on. They ended up settling on sending Mat Latos to Miami for a prospect arm Anthony DeSclafani. Their marquee move of the off-season was trading minor-league pitcher Ben Lively for Marlon Byrd. Byrd will make $8 million this season and has a $8 million team option for 2016. Basically, the Reds didn’t really want to do much to go out and get any true help but were very careful about how they tried to sell. They’re in a weird purgatory stage where they’re not really building to go for it, but they don’t want to raise the surrender flag too early in a season when they’re hosting the 2015 MLB All Star Game. That might be the only saving grace for the Reds current core that this roster was supposed to be built around for a long time. If the Reds do fail to be competitive in the first half of 2015, we look for them to become major sellers in the market from the time the All Star Game ends and the July 31st trading deadline. On paper, the Reds have a pretty nice lineup if these guys can stay healthy and they can field it for 150 games or better. Of course, you look at the heart of the order and with Joey Votto and Bruce being the foundation that will make the entire group function better, the Reds need close to what those two guys have posted as their best seasons if they’re going to be successful. You want to know why the 2014 Reds finished 76-86? Look no further than the walking-disaster of a season Bruce posted last year. He battled injury, pro-longed slumps, his own mind, and finally by the end of the year Bryan Price was giving him mental health days off against opposing RHP who were average arms. I hope I am wrong on this, but I feel like this could be Bruce’s last season as a Red no matter what – which would be sad. If he comes out and looks to be having a bounce-back year, the Reds clearly view him as a contract they can easily move. They’ll sell high, rather then ten cents on the dollar like they were looking to do in the off-season; because the team isn’t going to contend for a Wildcard spot or the NL Central division. Or scenario two, Bruce is once again the player that has showed signs of long-term trouble. The shift is ruining him since he’s decided to become a dead pull hitter. Maybe the Reds hitting instructors ruined him. It’s chicken or egg, and the only thing we can say is Bruce looks like a completely different hitter than when he came out of the minors. Votto is a different story, where he’s in a contract that will never be moved and likely ends badly for the Reds. He hit .255 in 220 at bats last season but still got on base at a .390 clip. We have already stated that we would like to see him stop being so passive at the plate and start driving the ball more. The Reds are paying him too much money to be the guy who simply leads the league in walks. 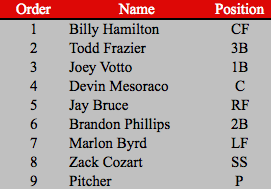 Hamilton, Mesoraco, and Frazier represent the most upbeat focal points on the Reds roster right now. They’re probably going to be in a Reds uniform for at least the next four to five years each. They’re still on the climb up as players. Hamilton has 69 steals in 165 big league games. If he could cross the 70-steal mark, that would be nice; and hopefully he improves his batting average by 10 points to become a .260 guy and gets that on-base average to over .330 at the very least. Just not sure he’s that type of guy. If he’s going to stick long-term in the league as an every day player, he’s going to have to do more than just steal bases. He also exhibited a nice glove in center (1.8 dWAR) so we’ll admit, he does a bit more at this stage in the game besides stealing bags. Mesoraco was awesome despite being banged up. He posted an .893 OPS with 25 home runs and 80 RBI. He hit .273, proving our prediction right that he would hit in the big leagues as he has at every other professional level. Todd Frazier was an All-Star, hitting 29 home runs and driving in 80 while stealing 20. He’s not as pretty as Aaron Boone was in any facet of the game, but he’s a grinder who puts up similar numbers. We don’t have high expectations for Phillips, Byrd, or Cozart at this stage in the game. Phillips is still a decent glove at second base and you just hope he quietly goes about his 2015 campaign as a pro. Cozart was probably the worst every day regular at the plate last season and he probably gets to keep his job unless Eugenio Suarez (acquired from Detroit for Alfredo Simon) can push him somehow. Byrd hit 25 home runs, drove in 85 and finished with a .264 average with the Phillies last season. This is his age 37 season, he’s made his money; and the best thing we probably have going for us is he’s playing for that 2016 season at $8 million dollars. Things like that matter to guys like Byrd. He’s not going to be a shining leader in the clubhouse. He’s not well-liked according to some well placed sources we have. The Reds starting rotation appears to be the weak spot, especially if they have an injury or two which inevitably seems to strike every year. There are so many question marks. Cueto could be the biggest trading chip at the deadline. Homer Bailey has some arm problems going on and has not thrown off a mound at the time of this post. DeSclafani has plus stuff, but limited big league experience. Tony Cingrani hopes to make the rotation but with his past arm troubles and problems that arose when he was converted to a starter; it might make more sense to use him in the bullpen. When Mike Leake looks like the one true given to be a fixture all year, you’re probably headed for a bad way. Don’t forget they just had to go out and sign Paul Maholm and Jason Marquis as some kind of ugly insurance policy/torture device for Reds fans. You can never have too many recycled, over-the-hill arms to fill out your starter slots! Way to go Jocketty! 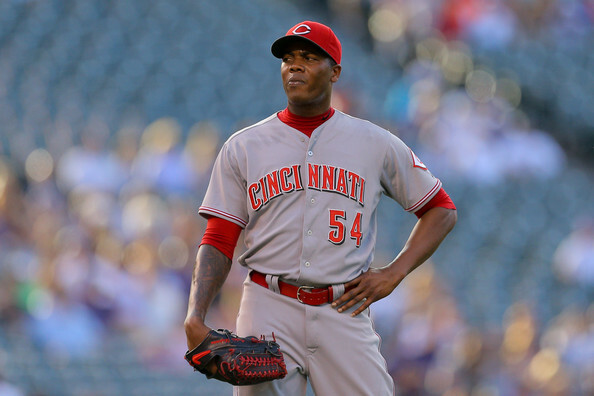 And at the very least – the Reds boast Aroldis Chapman as their closer. He should get his 35 to 40 save opportunities this season. Watching him in a Reds uniform is a true joy, and we hope they choose the route to extend him and keep him in a Reds uniform for his career rather than look to deal him before he’s a free agent. The other pen arms just aren’t that good, even if some of them have good fastballs. Jumbo Diaz, Sam LeCure, Manny Parra, Burke Badenhop, J.J Hoover and Dylan Axelrod just aren’t a group that excites. I probably favor Diaz and LeCure the most of that group. I hope we see Raisel Iglesias setting up for Chapman at some point, but we are so much more likely to see Pedro Villareal. It’s just going to be a tough year again, you can feel it. The Reds probably trade Bruce and Cueto shortly after the All-Star game for a bunch of guys who ‘might’ be solid big league players someday. The division as a whole is really going to be better, with the Pirates, Cardinals, and Cubs now all having a say for the crown in our eyes. Hopefully the Reds stay completely healthy and don’t have to worry too much about depth. Hopefully Bryan Price proves he’s more than just a sheep in manager’s clothing. Hopefully the rotation has no injuries and all those guys make a full season worth of starts. It’s just a lot of ‘hopefully’ with the Reds this year. The shark has jumped on their true window to compete, and this year it becomes a sad reality. The Reds are heading for another period of rebuilding; and folks like us will have to face the fact that the current guys we were sold on as the future never got it done. We’ll face a boring period again where the Reds have to fight things out in purgatory, never knowing if the next group of players chosen for battle are going to do any better. ← Previous Story Marty Brennaman is ready for another grumpy season as the voice of the Reds!